They got Sino Group on board as their first major sponsor, and I remember making the trek to Yau Tong (just a couple of buildings down from the new location) to attend the opening ceremony of their first warehouse - where representatives from Sino, including Executive Director Daryl Ng - picked up brushes and cans of paint and helped paint the walls of the barren space. That was a 1,600 sq. ft. space back then. Then Tigger worked his connections built up over the years as a car nut, and somehow Feeding Hong Kong began collecting and delivering food in Mercedes-Benz vans - including refrigerated ones. Then Gabrielle Kirstein, the tireless Executive Director of the group, began putting together different programs to extend their reach. First came the Bread Run, where groups of volunteers go around town and rescue perfectly good bread that would otherwise have been thrown away. They do this a couple of times a week, and the collected bread is then redistributed to charities. They also launched their Chefs in the Community project, where chefs and nutritionists around town take time to come up with recipes for simple, nutritious meals where the ingredients cost about HKD 10 per portion. These are then published in cookbooks - there are now two - to teach underprivileged families how to feed themselves on a tight budget. With 1 out of 5 people living below the official poverty line in Hong Kong - and surviving on a daily food budget of HKD 30 or less - this is an important aspect of how to get people to properly feed themselves. As if those weren't enough, they have embarked on another project to create Edible Gardens in different parts of Hong Kong. Sustainable urban farming in the concrete jungles of Hong Kong. I had the pleasure of visiting one of those gardens last year. ...and even have a big, walk-in freezer AND refrigerator! 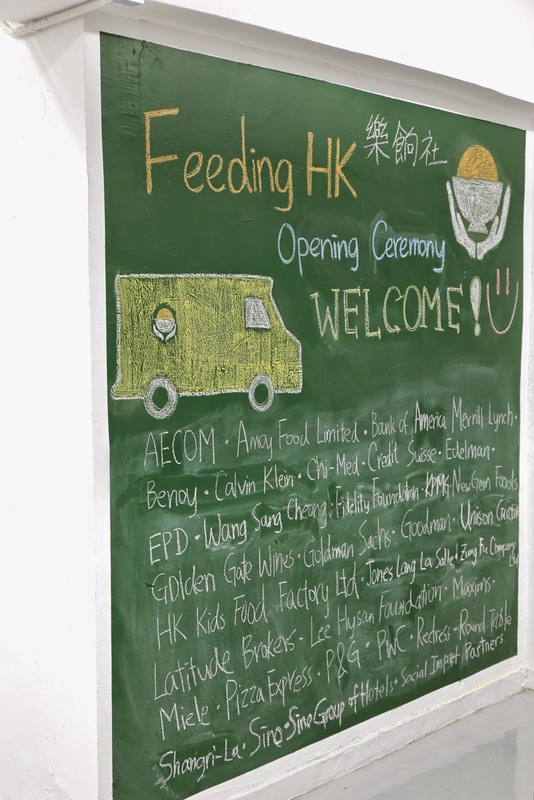 A quick look at some of the stats of what Feeding Hong Kong has achieved in 2014 shows that they collected and redistributed over 200 tons of food by partnering with 100 food companies in support of 58 local charities. Very, very well done, Gabs, Christina and Tigger! While distributing 200 tons of food over a year's time may seem like a lot - and it is a lot for a small organization to have achieved - it is a drop in a bucket when you realize that over 3,600 tons of food are sent to the landfills in Hong Kong every single day. Please visit Feeding Hong Kong's website and find out how you can help.